Audiobook Week Is Here! [TSS] – my books. my life. Well technically it starts tomorrow, but I’m too excited about it to wait until the official date to tell you how excited about it I am. Audiobook Week is a little (and by little I mean huge) thing Jen from Devourer of Books put together. You can read more about how you can get involved here. And I am doing all of this despite currently being out of town. Impressed? Yeah, I thought so. Hope everyone is having a wonderful Sunday (and a happy Father’s Day to all the dads out there). And I hope everyone participates in Audiobook Week. So glad you’re excited about this, and I think you’re awesome to get so much posted when you’re out of town! I’m crossing my fingers for you to win something! 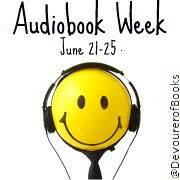 It is wonderful that you are going to participate in Audio Book Week eventhough you are out of town (and probably busy). Hope you have a wonderful time listening to your favourite audio books. I will look forward to reading your posts on them.